Asurion is committed to ensuring that all employees feel valued and have a genuine opportunity to thrive and excel within the company. That’s why we created “commUnity,” Asurion’s award-winning diversity and inclusion initiative. In order to create “wow” experiences for our customers, we first have to understand their needs and preferences. Of course, this can’t be accomplished through data and research alone. We assemble diverse teams and encourage a variety of perspectives in order to create an inclusive and productive working environment for our employees. In turn, our products and services end up delivering exactly what our customers want. At the heart of commUnity is our rapidly expanding Employee Resource Groups (ERGs), which unify Asurion employees with common interests for networking, mentorship, problem-solving, and volunteerism. Our ERGs are a reflection of the diverse Asurion commUnity, help us stay attuned to the pulse of the company’s culture, and assist us in connecting with the broader external communities we serve. Black Employees Supporting Talent: BEST seeks to provide employees, and specifically those that self-identify as Black, African, African American, West Indian, or of African descent, with additional professional development, networking and community engagement opportunities. ¡Hola! Launching in 2018, ¡Hola! 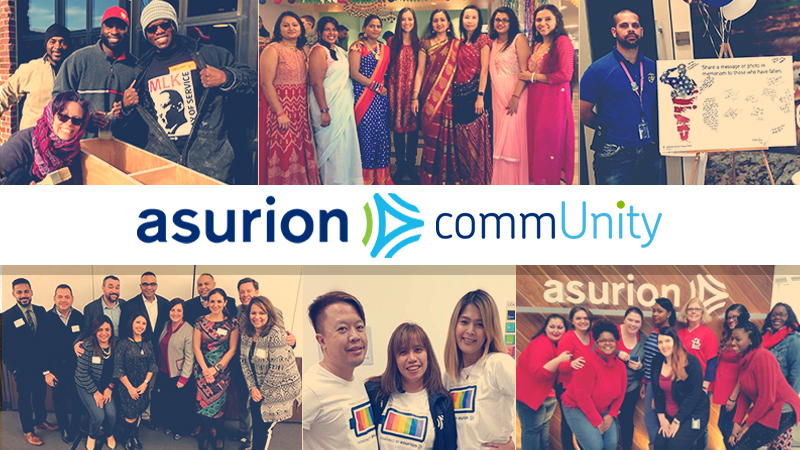 will work to foster an inclusive workplace and help recruit, develop, and retain top Latino and/or Hispanic talent within Asurion, through education and awareness. PRIDE (LGBT and allies): PRIDE fosters an inclusive workplace, helps to recruit, develop and retain top LGBT talent within the Asurion enterprise. Women’s Initiative Network: WIN’s purpose is to improve collaboration, enhance the employee experience and propel individual and collective performance to the next level. Veterans Service Group: VSG’s mission is to provide value to the Asurion community through education, awareness, and inclusion of veteran employees. We operate as a service organization to enrich the lives of those in need within the surrounding communities. Young Professionals: The Young Professionals ERG seeks to create a culture of inclusion and learning where young professionals beginning their careers can come together with established individuals of any age for guidance. REMOTE: A resource for remote employees. Its mission is to strengthen the Asurion community through education, awareness, and inclusion of remote employees while developing and enabling both growth and retention. Not seeing a community that’s a good fit for you? Employees are encouraged to propose and develop plans for new ERGs that further the company’s diversity and inclusion goals. Everyone has a voice at Asurion. Asurion has over 16,000 employees in 53 locations around the world, with our global headquarters in Nashville, TN. Click here for career opportunities.